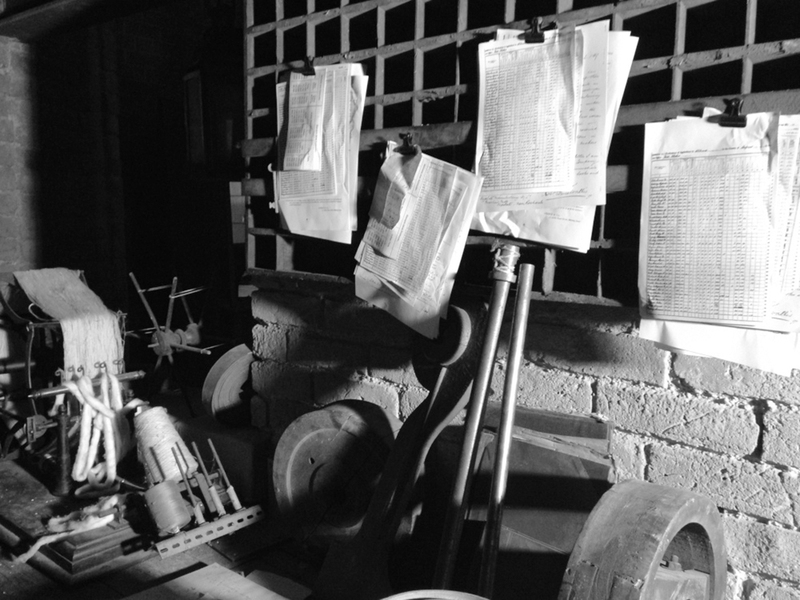 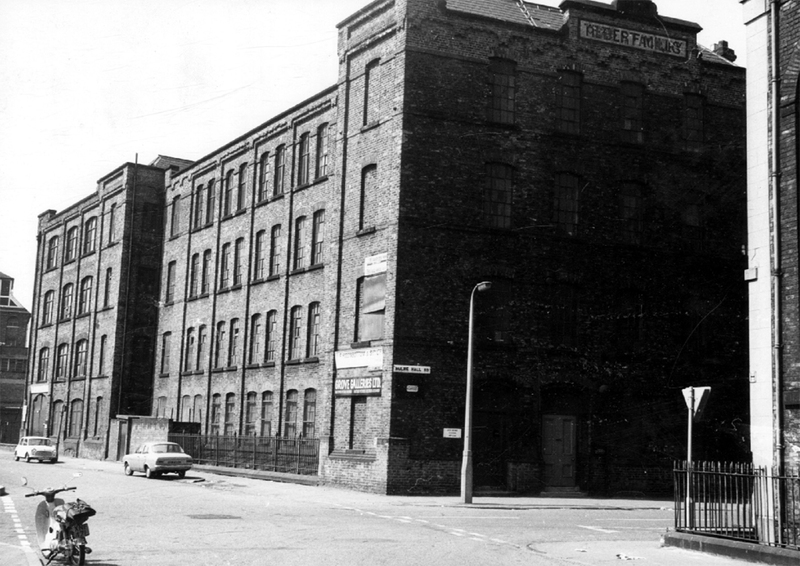 A BRIEF LOOK THROUGH THE HISTORY OF TALBOT MILL. 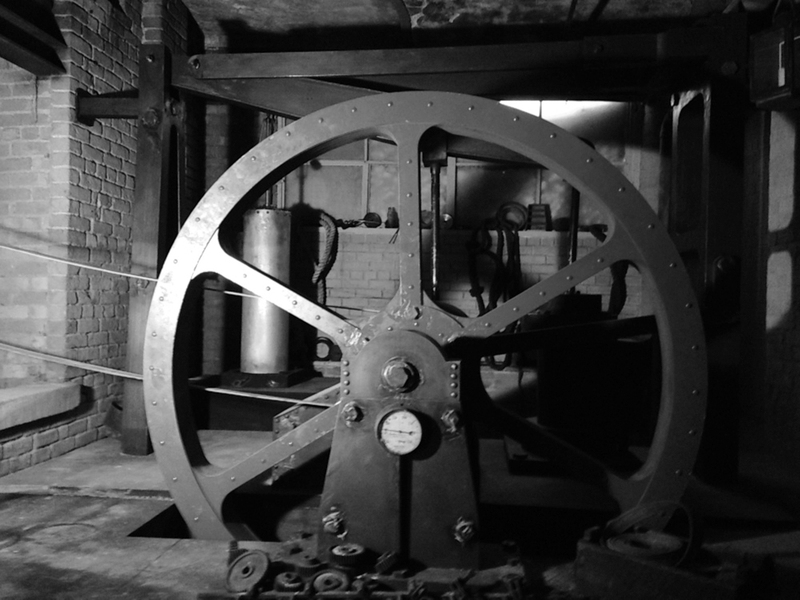 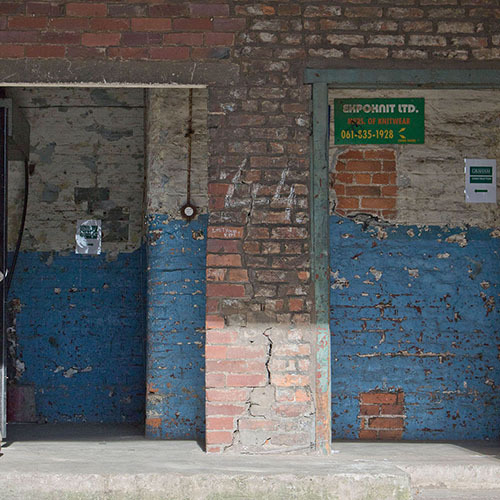 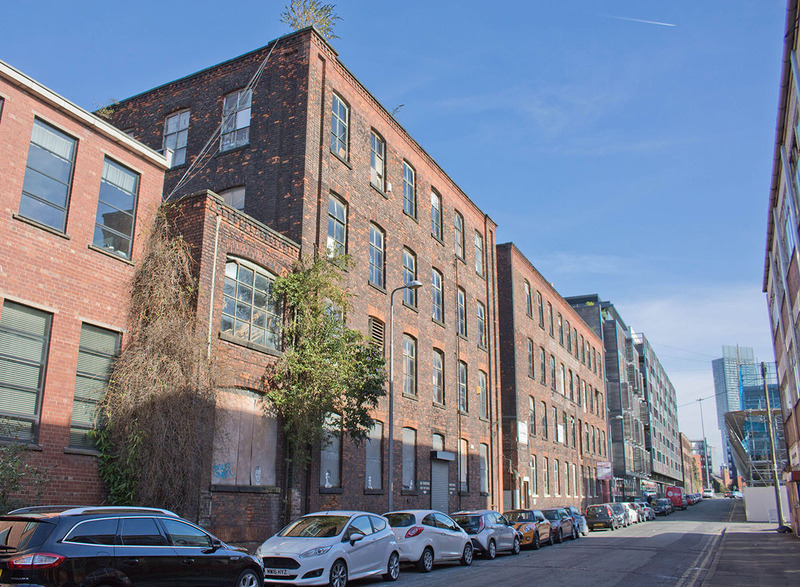 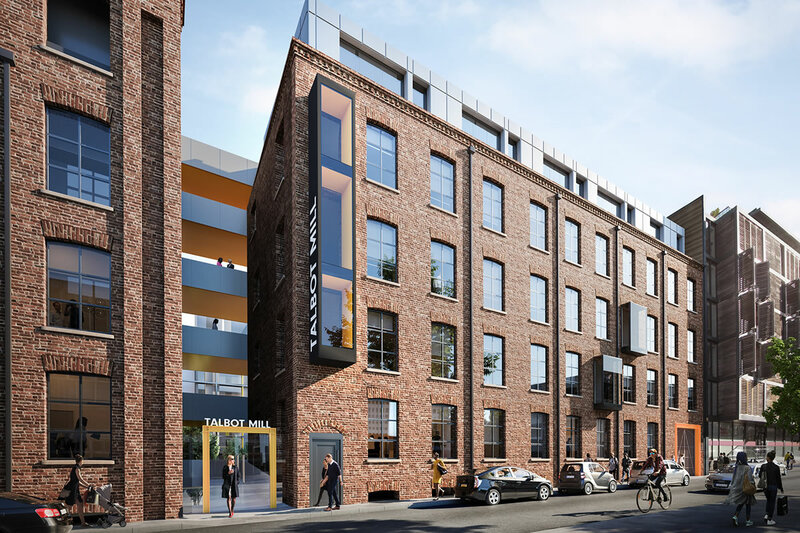 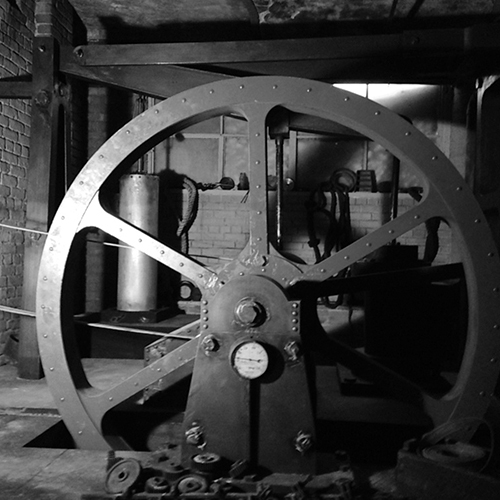 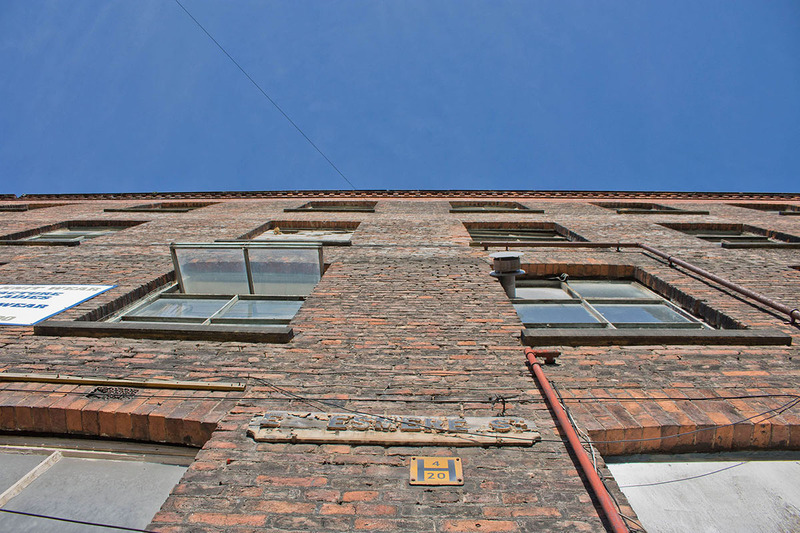 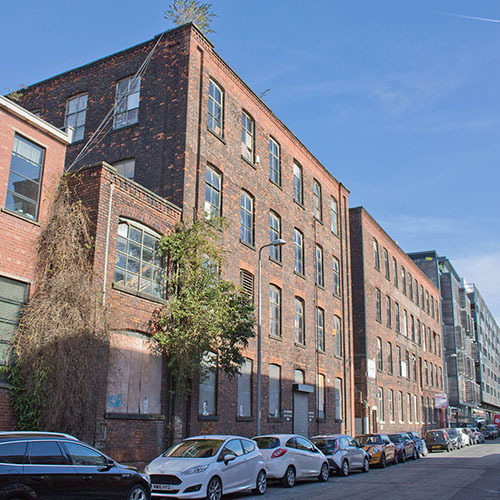 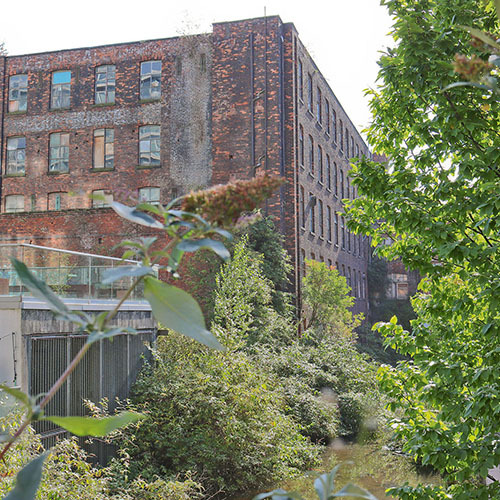 From it’s original operation of sewing cotton, to it’s recent use as a period drama film set, Talbot Mill has a rich past that travels back through Manchester’s place in history. 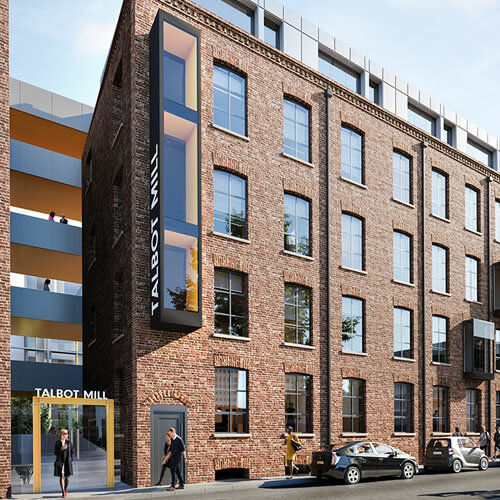 Take a look at what Talbot looks like now. 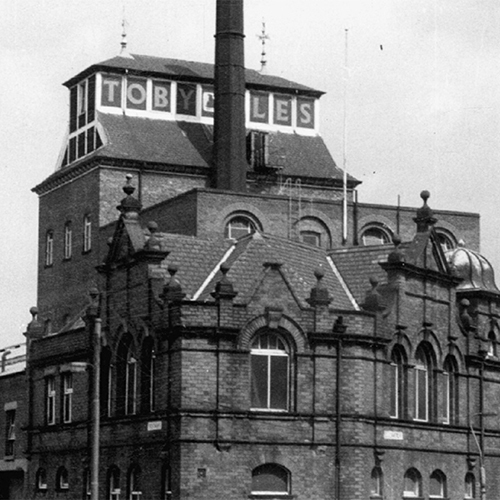 TALBOT MILL OVER A CENTURY AGO. 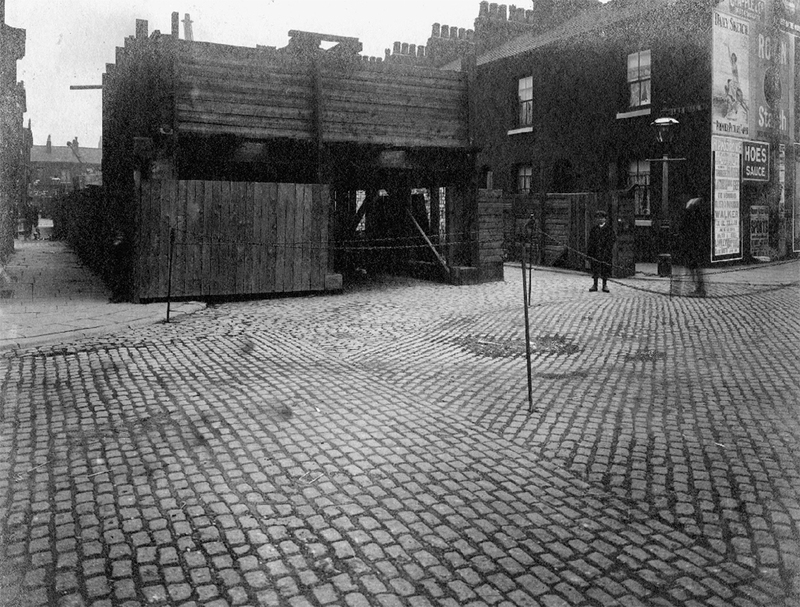 This footage was captured in 1900 and commissioned by Mitchell & Kenyon. 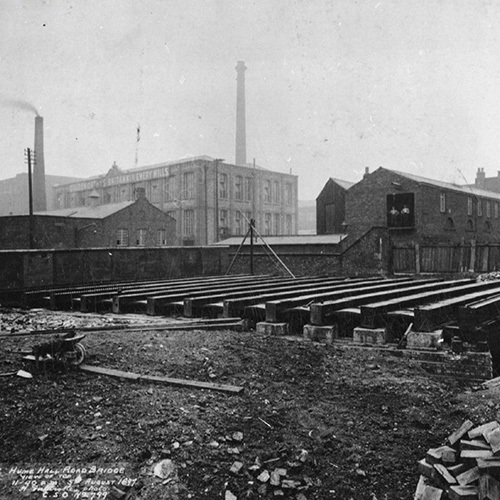 It shows the mill workers leaving work for the day, many of them young people and mostly mill girls. 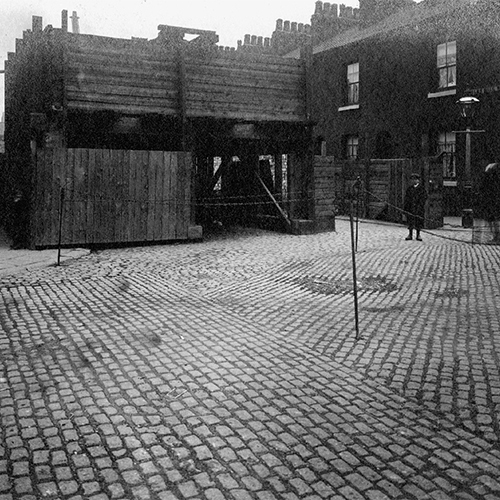 This is was a common sight because education was only compulsory for children aged 5-10 from 1880 to 1918. 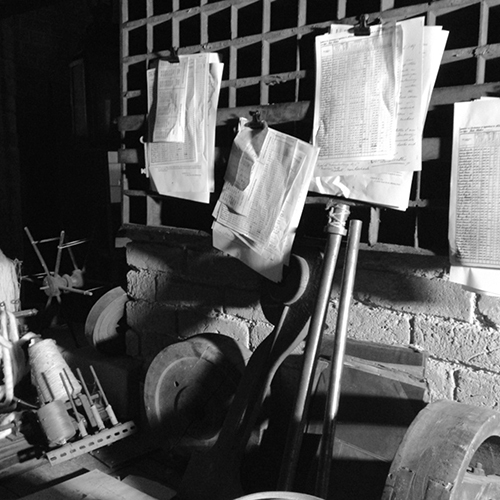 The younger children were employed for general, unskilled work. 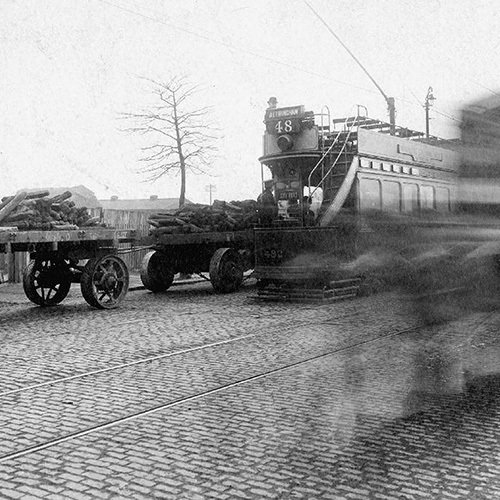 They would walk the aisles, picking up and gathering the cotton waste. 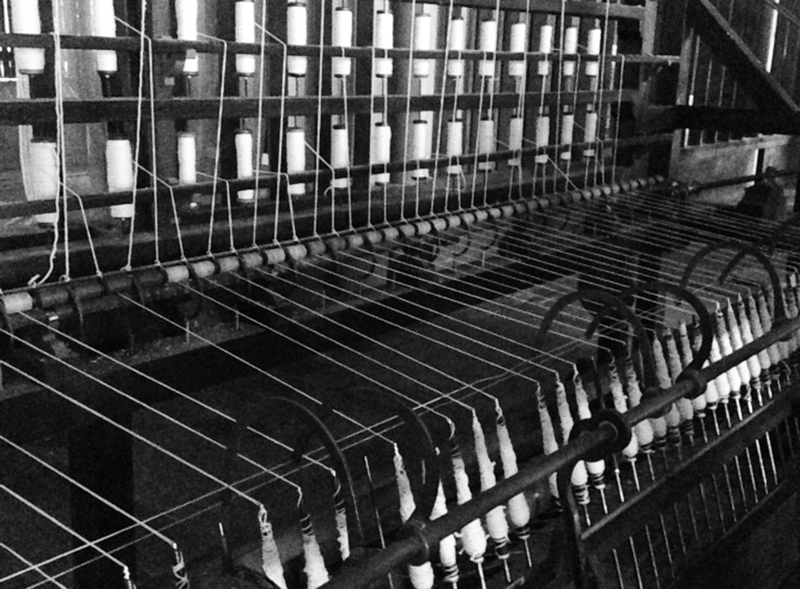 They would also fix broken thread as this needed small hands but was very dangerous. 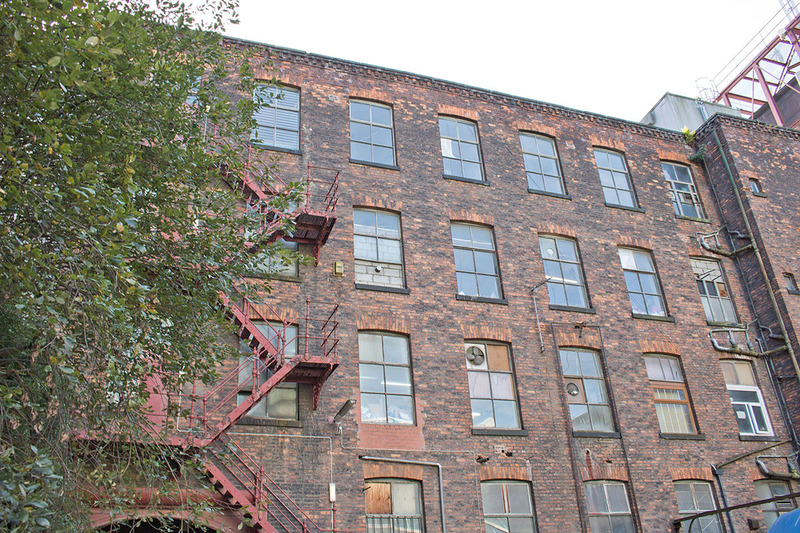 When looking at maps and directories from the period between 1850 — 1860 there are conflicting accounts about when the mill was built, but Talbot was most likely constructed in 1855. 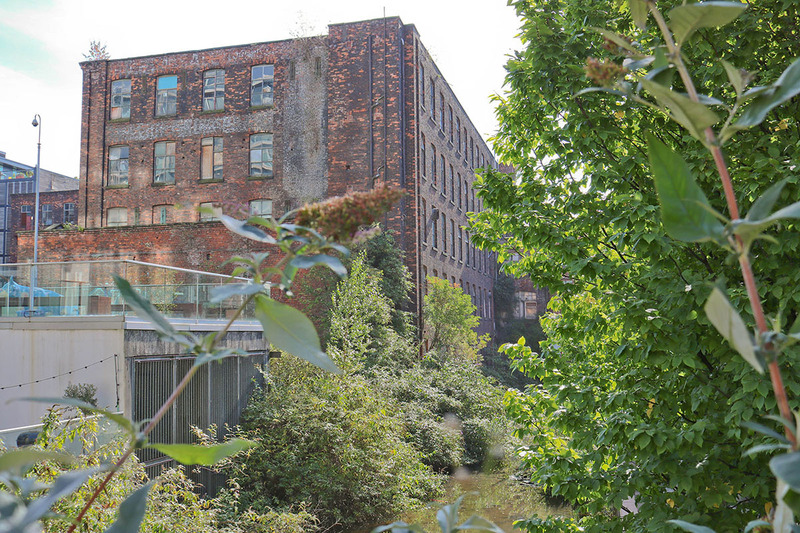 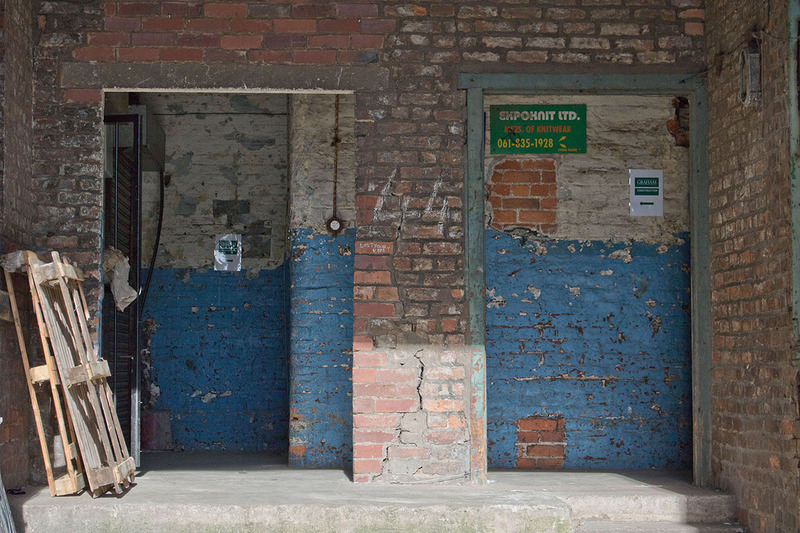 From its inception, the mill produced sewing cotton and a wide range of threads for much of its early life until 1930, where it was occupied by a number of textile related businesses and during the 1980s, one floor was even a mushroom farm. 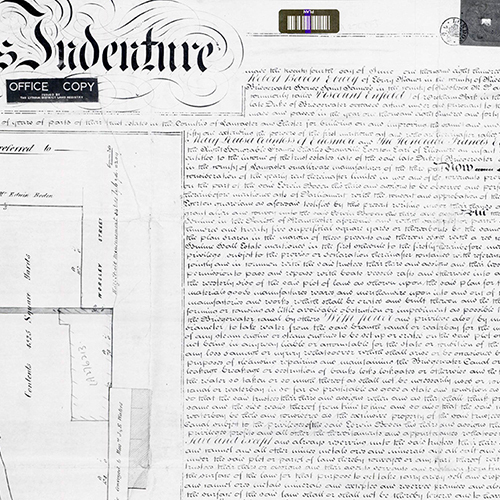 A historic deed from 1864 which transferred the title of Talbot from the trustees of the then late Duke of Bridgewater to one Edwin Booth. 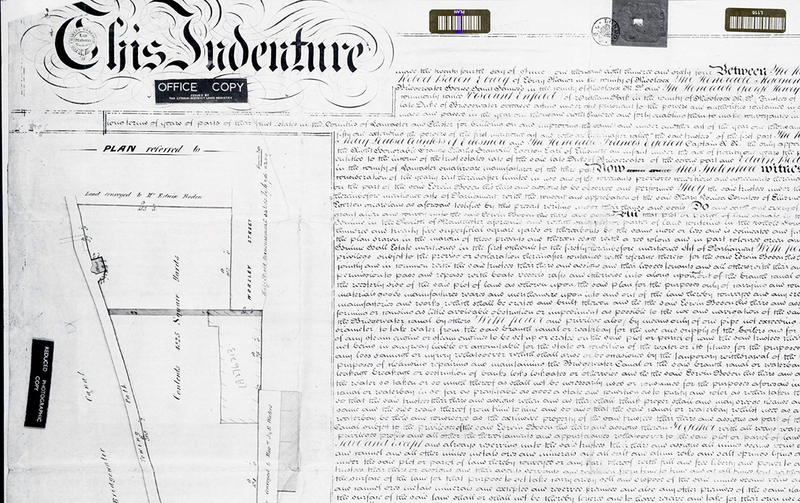 It also features some incredible calligraphy. 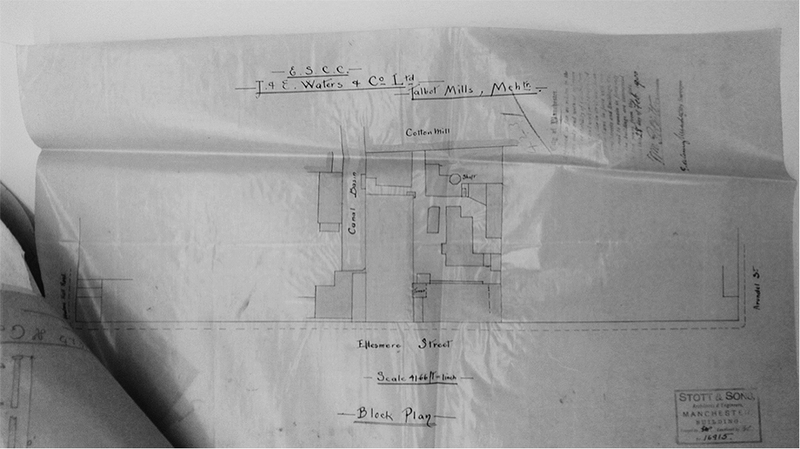 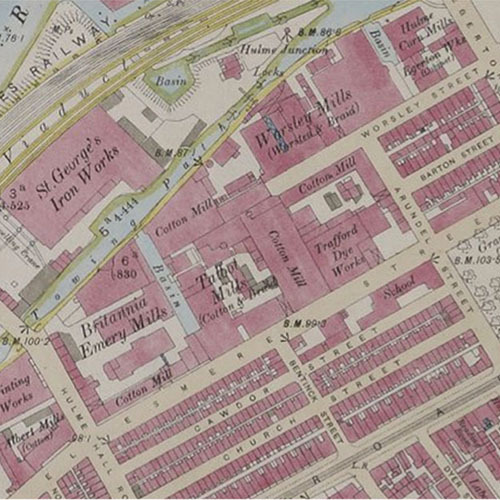 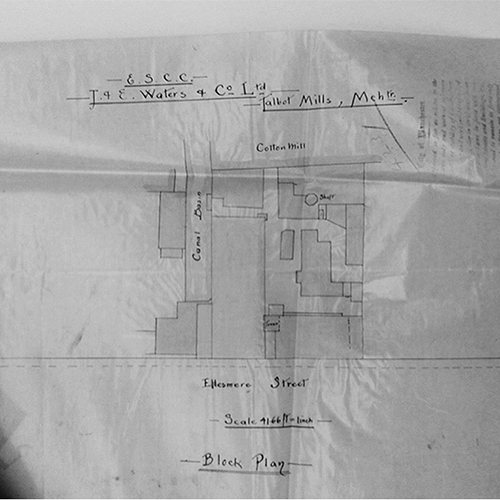 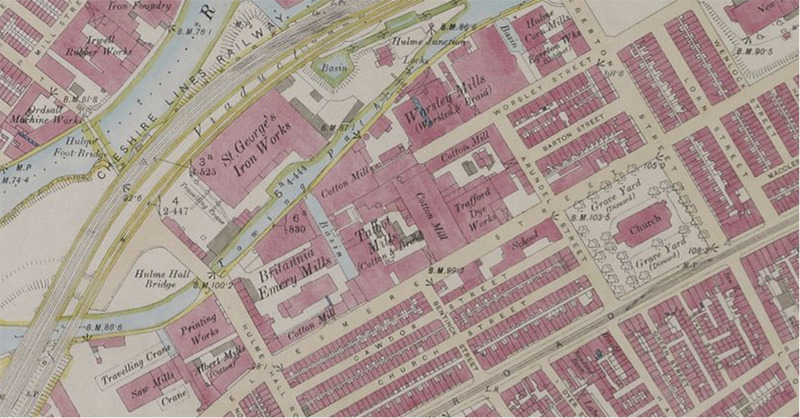 This plan from just before the turn of the century, identifies Talbot Mill within the local area, rife with industry. 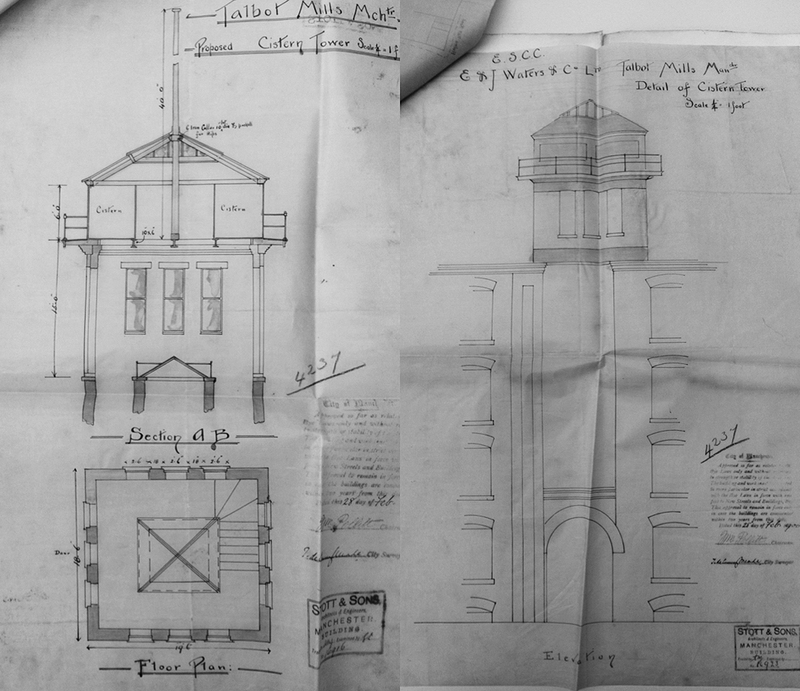 In 1906 some changes were made to the building. 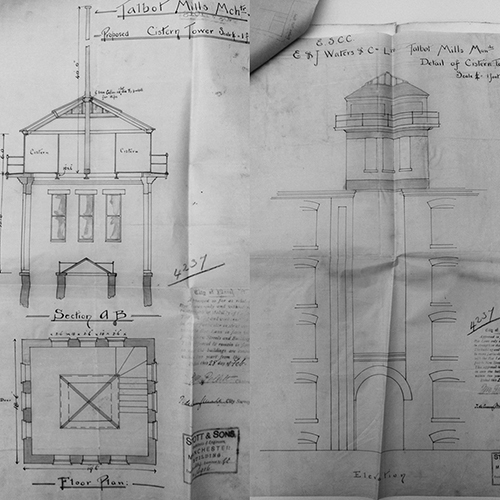 These plans show some of the changes, including the addition of a rooftop cistern tower, complete with a walkway. 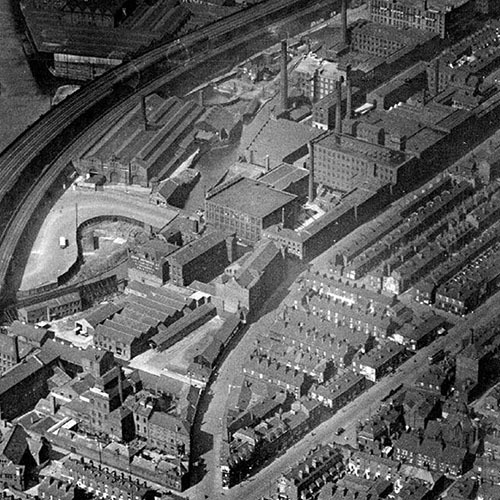 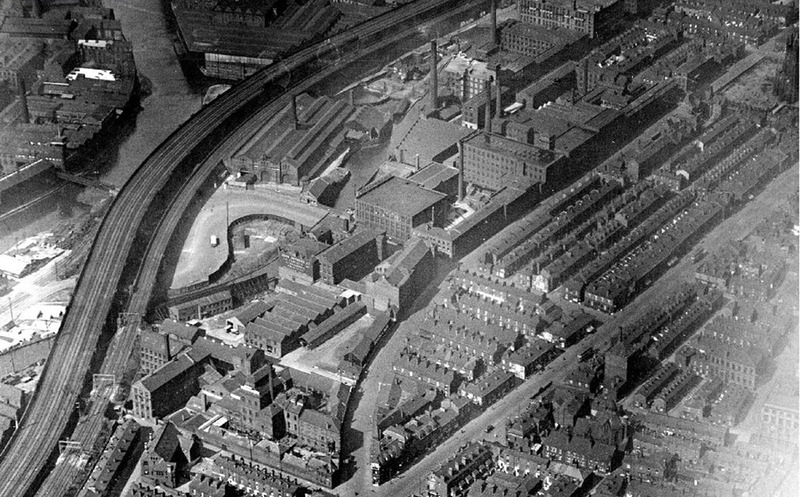 An incredible aerial photo showing Talbot amongst the industrial landscape of Manchester. 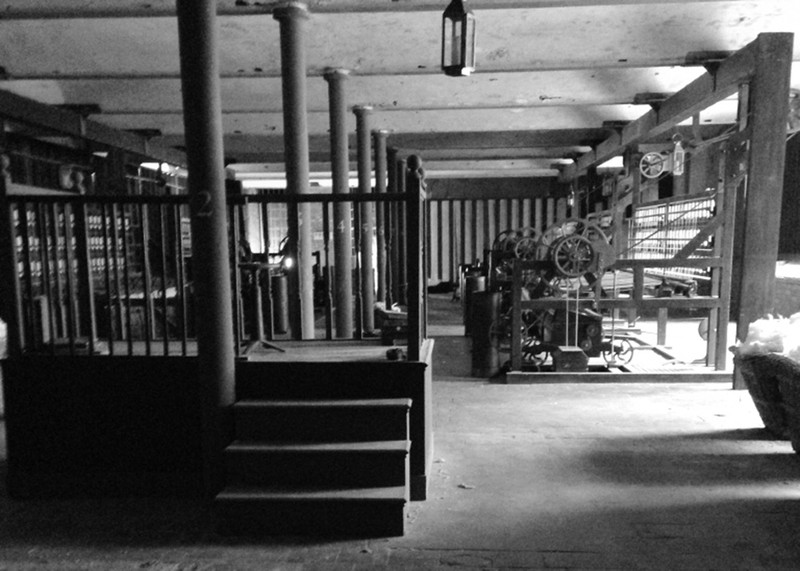 Set from “The Mill”, 2013. 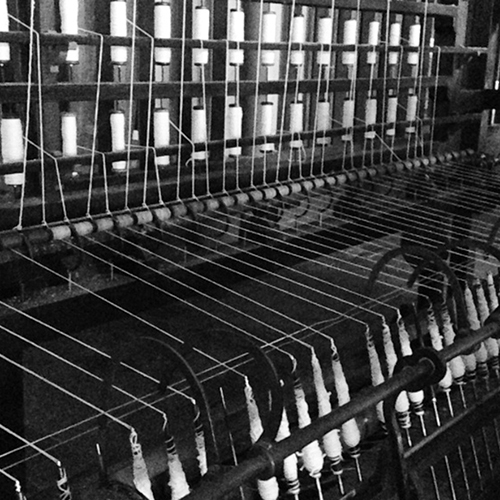 In 2013, a channel 4 period drama was shot within Talbot Mill based on real-life stories and people of the textile mill workers at Quarry Bank Mill in Cheshire. 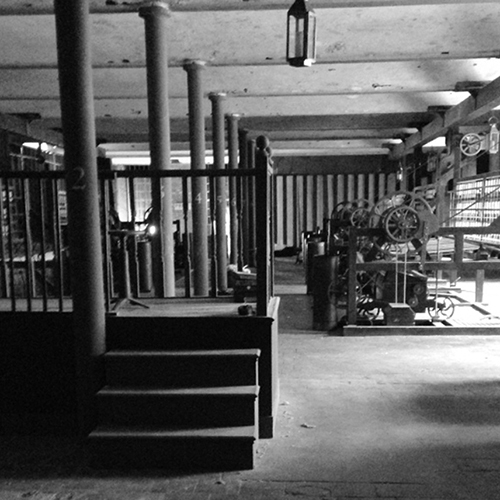 These are the replica engine and mule rooms built for the show. 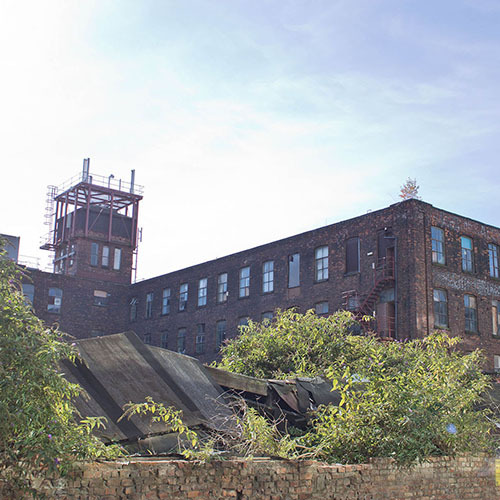 THE BUSINESSES AND BUILDINGS THAT COMPRISED AND SURROUNDED TALBOT MILL. 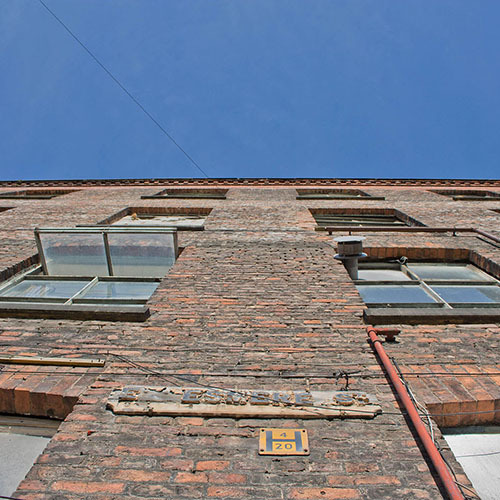 Talbot Mill flourished with success in 1897, when JE Waters joined with a number of other companies to form The English Sewing Cotton Company Ltd. During this time, the company found success through absorbing a number of smaller companies, allowing them to dominate the market. 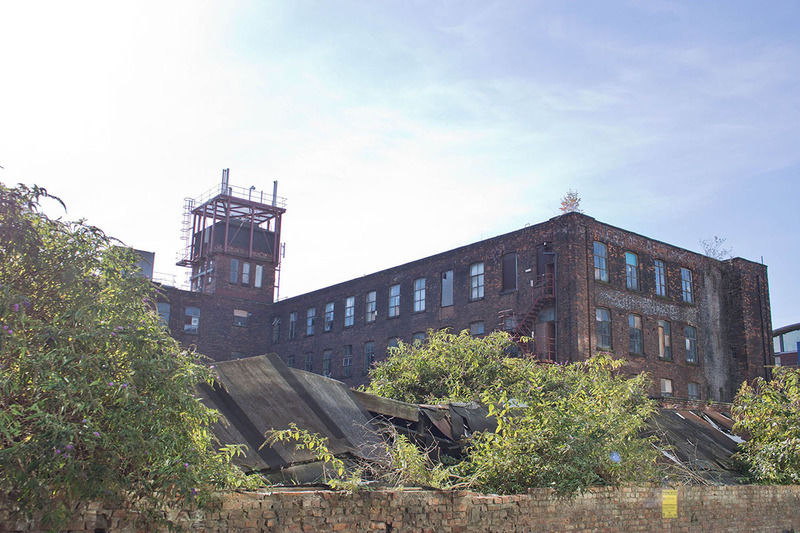 Throughout the century, the local area surrounding Talbot Mill was a hot bed of industrial activity, with manufacturing businesses ranging from beer to bullets! 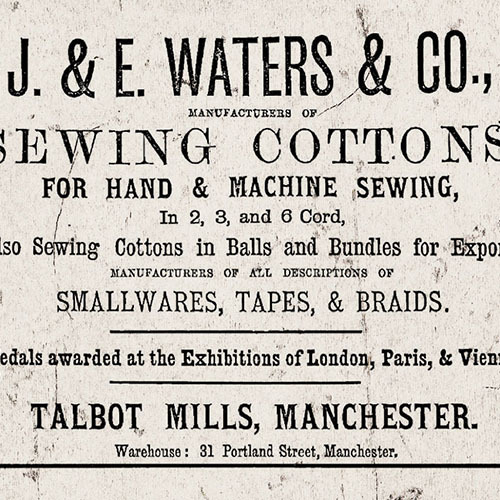 A typographical gem of an advert, by J&E Walters for their sewing cottons. 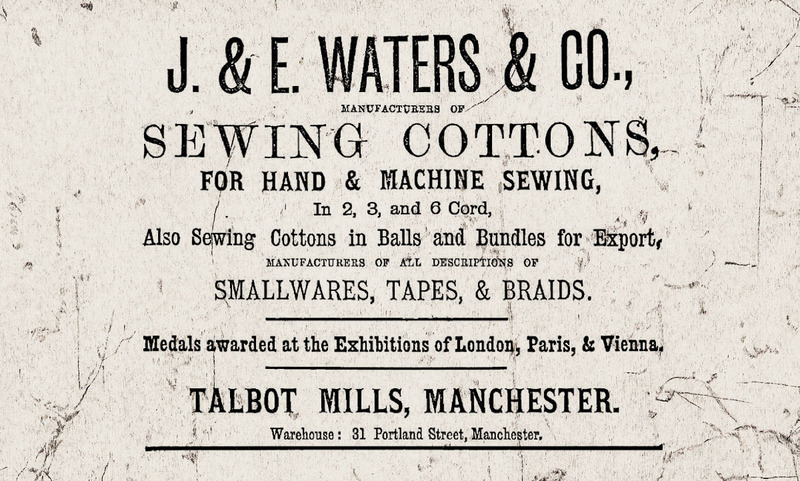 A J&E Walters graphic in the trade directory. 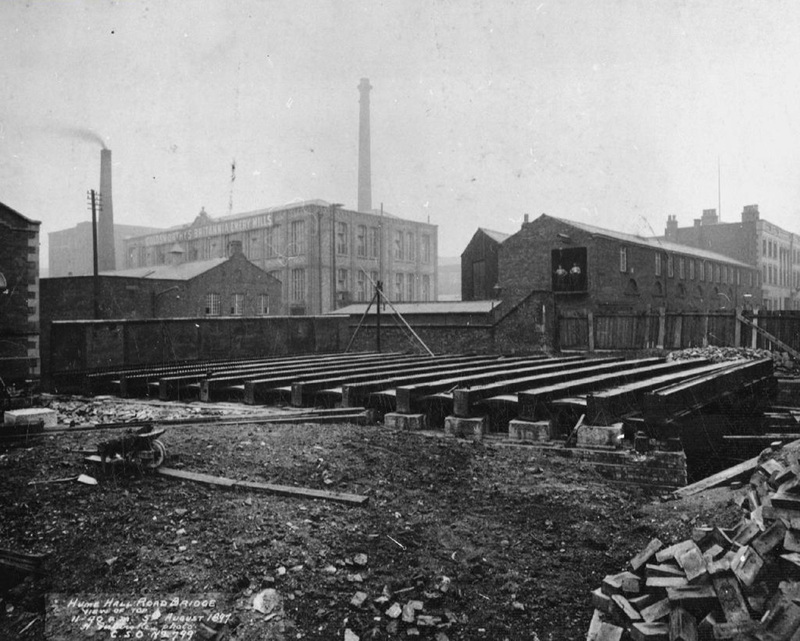 A photo of Britannia Emery Mills, shot from underneath the viaduct. 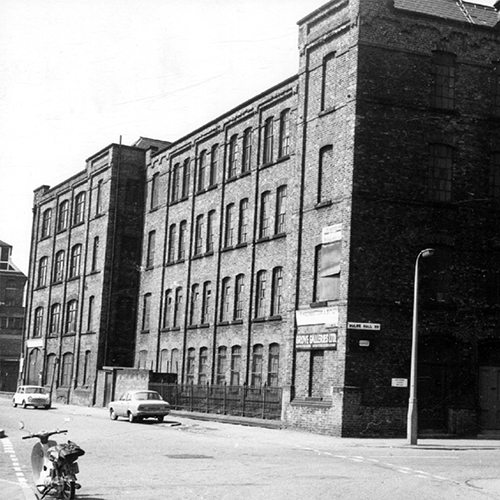 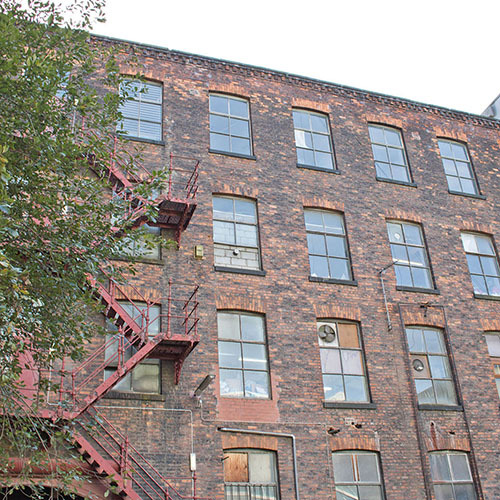 Albert Mill, further down Ellesmere Street. 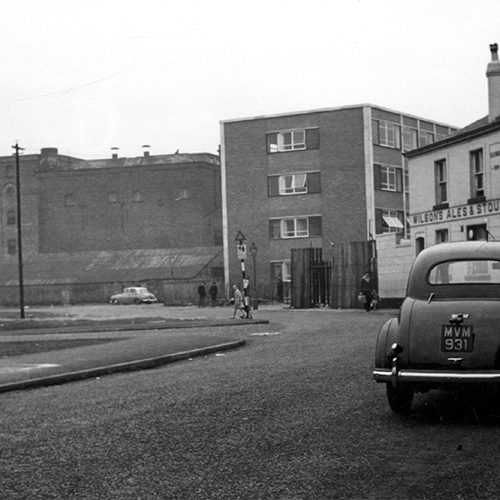 A view down the neighbouring Hulme Hall Road. 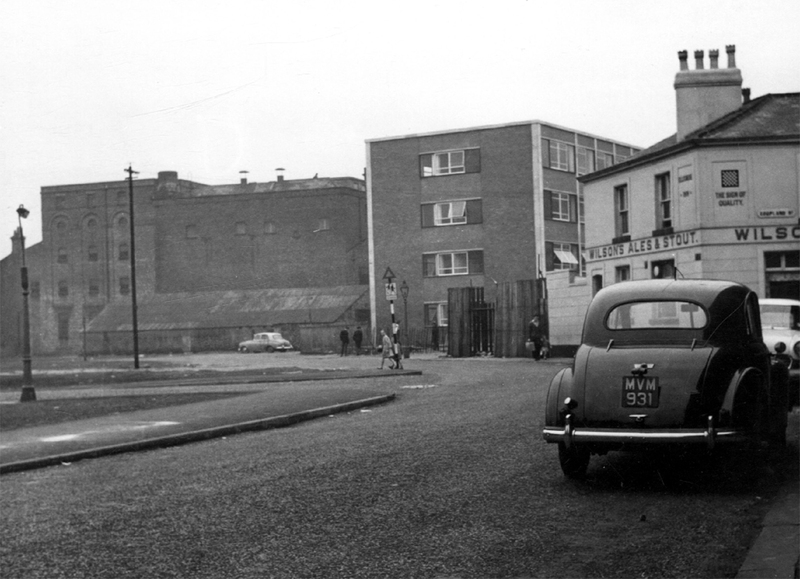 A view down Boundary Lane. 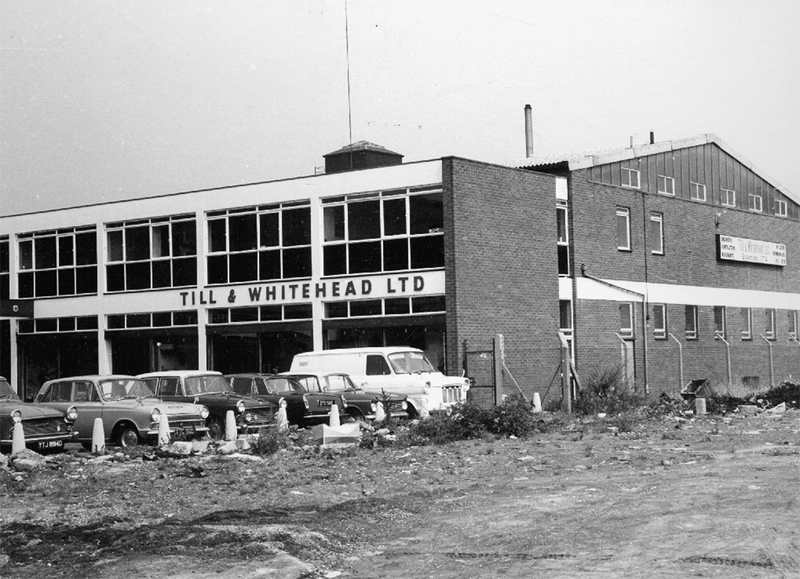 The Till & Whitehead warehouse, down Cornbrook Park Road. 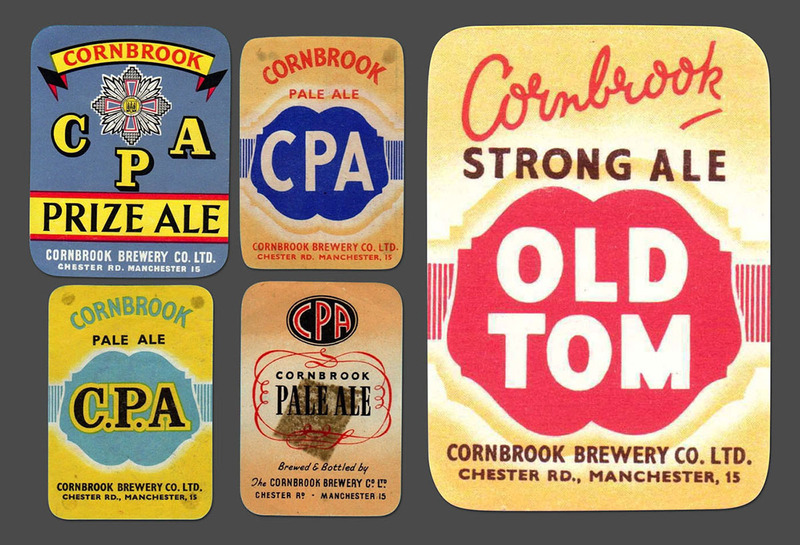 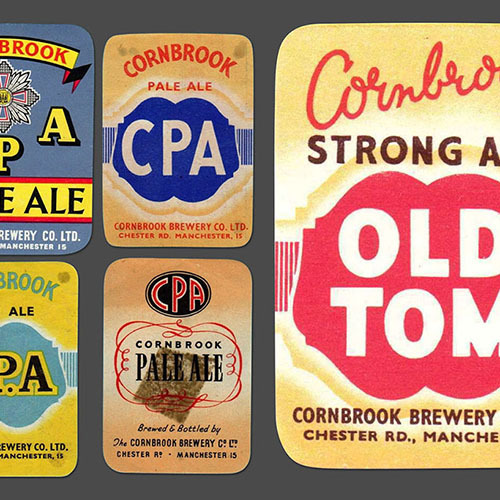 Cornbrook Brewery beer mats, 1973. 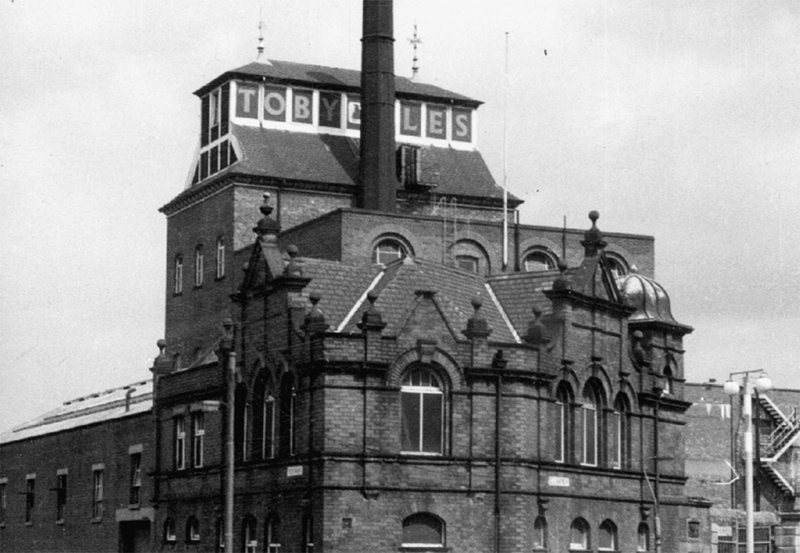 One of the more famous neighbours, the now lost Cornbrook Brewery which sat facing Talbot on Chester Road. 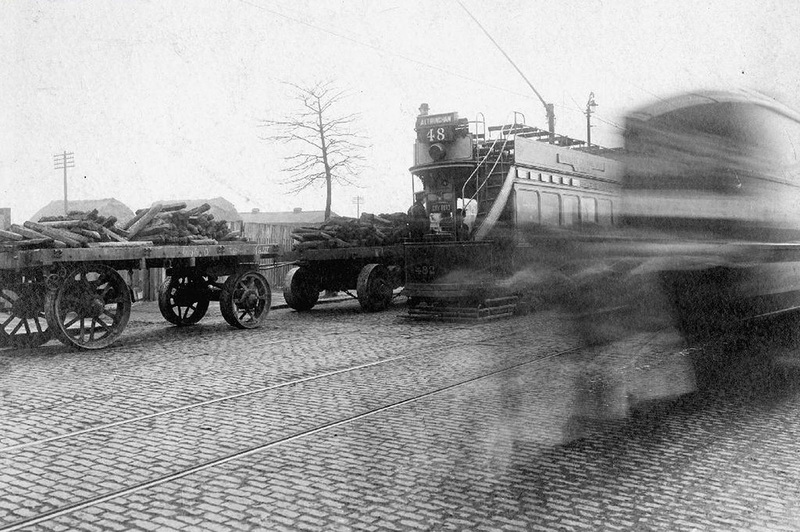 A photo of a bustling Chester Road with horses, carts and an Altrincham tram in shot. 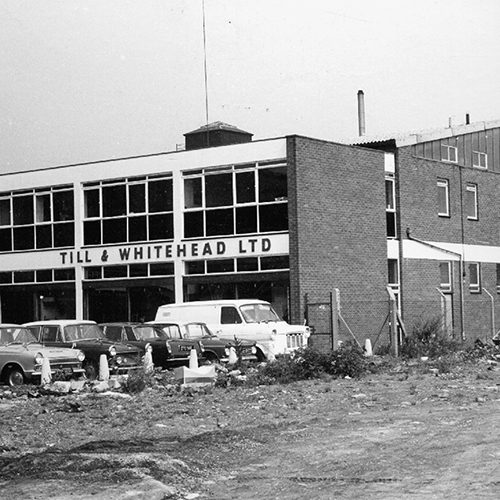 FILL OUT YOUR DETAILS HERE SO WE CAN KEEP YOU UPDATED ON EVERYTHING TO DO WITH TALBOT. 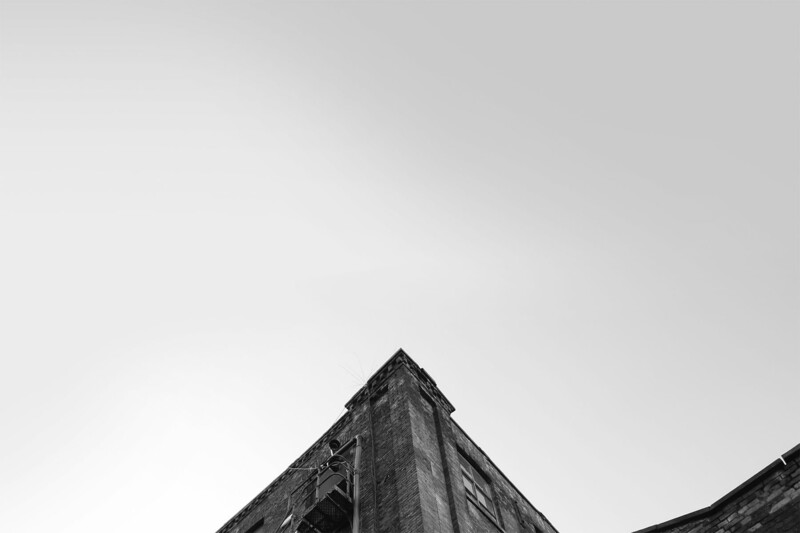 Do you consent to receiving residential marketing materials from Capital & Centric?